Las Vegas, Nevada – At ISC West 2018 (booth # 30078, April 11-13, Sands Convention Center). LEEDARSON, a global leading professional IoT ODM company, will reveal an unparalleled and impressive portfolio of Z-Wave protocol products and solutions. These advanced Z-Wave protocol products feature innovative and extensive interaction compatibilities. These incredible IoT products and solutions can be upgraded and customized to create a comfortable, intelligent and secure home that fits your own personal lifestyle. The Intelligent Door/Window Sensor is 2nd generation innovative product. Compared to 1st generation Door/Window Sensor which can only detect whether the door or window is opened or closed, the Intelligent Door/Window Sensor enhances the function of the “Smart Alarm”. When you are at home, and you want to open the windows to get some fresh air but not enough to allow someone entry into your home. The Intelligent Door/Window Sensor solves this problem perfectly. With the self-configuration mode, you can set the window to open within a set distance. If the window is moved beyond your designated “safe zone”, an alert will immediately be sent to your phone. This is a holistic and all-in-one secure design that provides the flexible yet simple way of protecting your home. LEEDERSON will also introduces the Z-Wave Home Security Kit. The LEEDARSON Z-Wave Security System settings give you peace of mind even when you are away from home. This system can be set to turn on automatically at scheduled times, and you will receive a smart phone alert when an alarm has been triggered. The home security system can alarm locally to alert those at home while also, scaring off intruders, and send notification to your smart phone if you are away from home. This remote accessibility allows you to monitor your home, 24/7, from anywhere. The LEEDARSON Z-Wave Home Security Kit includes a 4 in 1 sensor, Smart Plug, Water-leak Sensor, Motion Sensor and Door/Window Sensor. 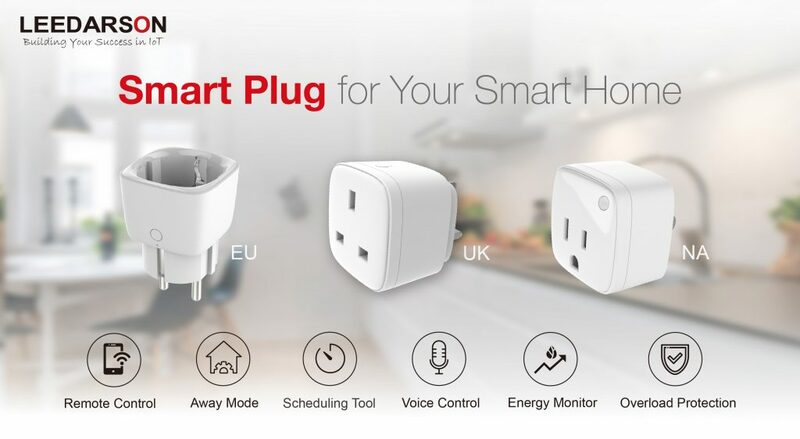 The LEEDARSON smart plug is one of the most universal devices and easily connects your home appliances. With a smart plug, you can remotely control your electrical appliances with flexible and convenient by using the mobile application. The product is compatible with Amazon Alexa, making it easy to connect devices to the Smart Plugs with voice commands. The plug is equipped with a power measurement feature which can measure the real time and accumulative energy consumption of the connected devices. The timer function offers an easy way for you to control the appliance anytime and from anywhere. Save time in the morning by turning on your coffee maker as you get ready for school or work. UK, EU and USA types are available. A small size sensor is equipped with exceptional measurement precision that can sense motion, humidity, temperature and measure light intensity. Installation is easy, low battery notification and firmware over the air updates are standard features. The LEEDARSON 4 in 1 sensor can create multiple user-defined scenarios and offers an unparalleled experience with convenience and ease of operation. LEEDARSON Z-Wave protocol products and Home Security Solutions offer quality, great services and excellent custom-setting experience. The company strives to provide valuable products, solutions and services with the aim of supporting a smart quality and secure life. For more information on LEEDARSON and our innovative IoT products, solutions and services at ISC West 2018, please visit booth # 30078 in Sands Convention Center. You may also contact us at iot.leedarson.com, by phone at (+86)-592-369-9963 or via email at iot@leedarson.com for more updates throughout the event. LEEDARSON is a world-class lighting and IoT solution provider. Starting out as a manufacturer of lighting products, LEEDARSON continues to evolve its business to now include smart lighting, sensors, gateways, smart accessories, apps, and cloud solutions. These products are widely used in residential, commercial and industrial applications worldwide. LEEDARSON launched smart lighting systems in 2010 and has since expanded its product portfolio to include sensors that address both lifestyle and life safety markets, controllers such as multi-protocol gateways and smart plugs and IP products such as cameras and video doorbell cameras. LEEDARSON can provide multiple solutions for your Smart Home that include areas of Home Automation, Home Security, Home Entertainment and Smart Lighting. Their powerful R&D teams, located in Xiamen, Shenzhen, Shanghai and Taiwan, have brilliant engineers and creative designers that keep them on the cutting edge of technology and innovation. Their fully-automated factory facilities are equipped with the most advanced equipment, and along with experienced workers, manufacture over 60,000,000 pieces of lighting and IoT products per month. LEEDARSON continues to advance its technology and broaden their product lines, year after year, with a goal to always exceed the customer’s expectations. At LEEDARSON, they are building your success in IoT.